Friendly Bridge creates an atmosphere of friendship and fun for beginning bridge players. In order to play in a Friendly Bridge game on Sunday afternoon or Tuesday evening, you need to be a non life master with less than 500 masterpoints. Sunday evenings are reserved for players with 0-20 masterpoints or 0-100 masterpoints. On Sunday evenings there are continuous beginning lessons from our Friendly Bridge book. These lessons start in March and September, but you can come in any time. Richmond’s Friendly Bridge games are held at the Bridge Center in Richmond, Virginia. Friendly Bridge Classes for beginners begin in September and March. Drop in any time. Call or email Ed for more information: 804-744-4870. Saturday Workshops begin in November and May. Call or email Ed for more information: 804-744-4870. Govind has been busy video taping some of Ed’s lessons. Check out Ed’s Video Lessons! 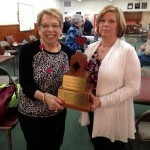 The Friendly Bridge Trophy is awarded twice a year (spring and fall) at a special trophy game on a Sunday afternoon. We are proud of our unusual handcrafted trophy. It was designed and created by Jerry Dellinger, one of our members, in 2004. It depicts the Friendly Bridge symbol of a smiling heart with the other card symbols on his hat and shoes. Everyone should want to display this work of art in their home for a few months of every year!